After just missing out on the district tourney for the past two years, Dallastown snagged the final spot in the bracket. Dallastown had been on the wrong end of this waiting game the last two seasons. Finally, the Wildcats boys' basketball team managed to break through and qualify for the District 3 tournament on Friday. This year, all the math favored the Wildcats. 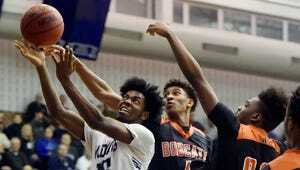 Dallastown (14-8) earned the 12th and final spot in the District 3 Class 6A tournament. At the start of the week, Dallastown actually sat one spot out of the playoffs. But when Wilson lost to Reading on Tuesday, Dallastown moved into the coveted final playoff spot. "Anytime you can get in the 6A playoffs it's a big deal," Dallastown coach Mike Grassel said. When the District 3 power rankings became official at midnight Thursday, Dallastown had reversed a recent trend it would rather never repeat. In each of the last two seasons, Dallastown was one of the final teams eliminated from postseason play. Two years ago, Lebanon edged the Wildcats out of the final spot by .004 in the final power rankings. Last year, it came down to a difference of .019 in the power rankings, with Dallastown again being one of the final teams eliminated. Wednesday night, it appeared the Wildcats had made the cut. But because the rankings weren't finalized, "I don't want to say anything, just yet," Grassel said. With a background as a math teacher, the coach joked that he had spreadsheets devoted to looking up all the possible scenarios. The large-school classification has some firepower with Reading and Lonnie Walker earning the No. 1 seed. Dallastown is scheduled to play No. 5-seed Carlisle and Deshawn Millington in the first round Tuesday, Feb. 21. Dallastown, however, just wanted a chance to play in the big tournament after coming so close and missing out in recent years. The program isn't about to complain, especially after surviving a tough league schedule this season. The Wildcats are willing to play anyone. "Division I has us battle-tested for sure," Grassel said. And when looking at the big picture, the experience should do nothing but help a young program. Donovan Catchings is the lone senior starter on this year's club, so the hope is that the young Wildcats will improve after experiencing the postseason.